Deciduous shrub of spreading, sparsely branched habit. Oblong to oval, green to blueish green leaves borne on purplish brown shoots. 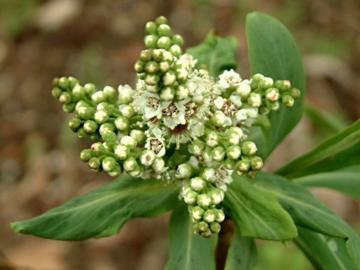 Racemes of small cup-shaped white or pale yellowish-green flowers in spring or early summer. Most reasonable, moist soils in sun or part shade. Native to Russia and Siberia. The species of Sibiraea are all very similar and sometimes grouped under the name Sibiraea laevigata.